Crochet a cute Merino wool leash for your four-legged friend. Crafting level: beginner. Style: wag-worthy. 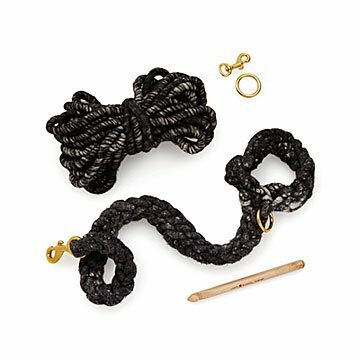 This kit has everything you need to crochet your own chunky dog leash: 100% Merino wool yarn, brass snap hooks and rings, wood crochet hook, and super simple instructions. In about 30 minutes, you'll have a unique leash to felt in the washing machine and snap on for walkies. Choose from large or small leash kits to fit the size and walking style of your four-legged friend. Accent with our DIY pom-pom for extra-adorable style. Kit designed by Waejong Kim and Anna Pulvermakher. Made in Key Largo, Florida. It might be hard to believe that Waejong Kim, a former interpreter and restaurateur from South Korea, and Anna Pulvermakher, a former software engineer from Russia, would have much in common. Both women had a change of heart in the early 2000s, abandoning their corporate jobs and moving to the big apple to pursue art. Their fateful meeting happened in at fabric painting class at the Fashion Insitute of Technology, and the rest was history. Today, Waejong and Anna are co-owners of a design company that produces DIY, and finished products made mostly from merino wool, an extremely versatile medium from Italy. Their hope is that every piece you (or they) create maximizes the beauty of the wool, and can be passed from to future generations. Give their unique creations a go for a modern take on an ancient art form. Small leash recommended for dogs under 20 lbs. Large leash recommended for dogs over 20 lbs.